Our powerful Time Management tools will revolutionize your business. Our dynamic Payroll Processing software is unique in its level of customization. run-of-the-mill, “one-size-fits-all” payroll provider. Our highly configurable approach combined with our employee management expertise and industry-specific knowledge – is what sets us apart. 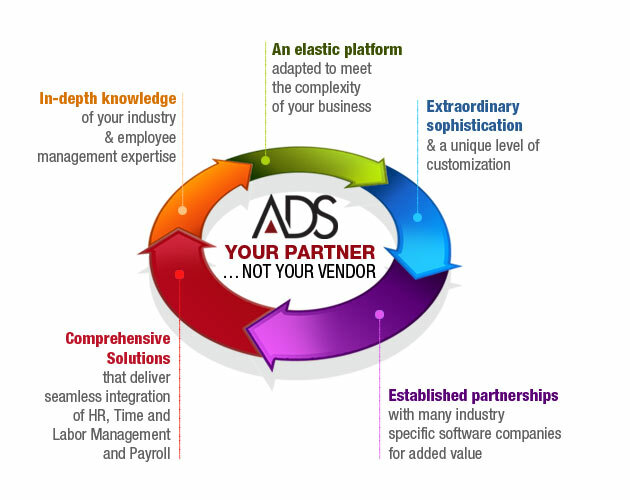 ADS provides a full prism of management services designed to solve your unique challenges. We collaborate closely with our clients to attain a common objective – avoiding manual and duplicate entries, and implementing seamless integration with the system of your choice with all aspects related to HR, Time & Labor Management and Payroll. In conjunction, we automate the workflow process with software that provides an extraordinary level of sophistication and flexibility. There is no need to force your data into a cookie cutter mold; the elastic ADS platform is adapted to meet the complexity of your business from end to end. All our consultants are intimately familiar with ADS operations, and following an in-depth analysis of your company’s day-to-day – can best determine a specialized solution that maximizes your resources and encompasses all your requirements. To further benefit our clients, ADS has established working relationships with many industry specific software companies and continues to seek additional partners to build better integration and Web Services technology. The advantages of our comprehensive approach and many years of experience in your industry are manifold: With ADS serving as an integral partner to your success, you can be confident that the totality of your needs will be met.